With unrivaled access to Manhattan’s stunning sunsets and skyline, Hell’s Kitchen is the go to destination to enjoy the best part of summer island life. Home to some of the hottest rooftop lounges and floating restaurants, here are some of our favorite spots in Hell’s Kitchen to relish the great outdoors and also indulge in fine dining. Escape the craziness of the city and set sail with Hudson’s at Pier 81 located at W 41st St and 12th Avenue. This 3-story 160 foot long yacht is the newest lounge and rooftop where people can relax and experience the beautiful views of the city while sailing along the Hudson River to The Statue of Liberty. Guests can choose to enjoy a sit down meal or take in the breathtaking views from either the indoor or outdoor bars. The menu is complete with shareable and small plates making it the perfect spot to grab a drink and hangout with friends. Platters including Charcuterie, which includes peppered salami, prosciutto de parma, hot chorizo, soppressata and cornichon as well as gourmet cheese platters pair perfectly with their extensive wine selection. On the other hand the chef also offers a selection of full dining options such as salmon, branzino, steak, chicken or more vegetarian friendly options. One of the more unique entree items is the Roasted Cauliflower that consists of cauliflower puree, pomegranate agro dulce, aleppo pepper and scallions. If you are feeling meatier indulge in the juicy and savory skirt steak, which is accompanied by faro, wild mushrooms, kale and chimichurri. During the summer diners can also opt for the for the weekend brunch sail that offers a myriad of hearty savory and sweet options marking the start of a fabulous weekend on the water. While Hudson’s could be considered as the Southampton Grande Dame, North River Lobster Company would be her younger and sassy Montauk sister. Also docked at Pier 81 on the Hudson River, this evokes the laid back atmosphere of a floating seafood shack. A popular spot to enjoy happy hour with friends, the 7 pm sunset sail travels up the Hudson towards the George Washington Bridge with a DJ setting the stage amidst spectacular views. From May through September bring your friends or family to taste the bounty of summer. The more carnivorous diner can sink their teeth into grilled chicken sandwich or the true American classic, the juicy hamburger. The nautical in you can enjoy a succulent lobster paired with vegetables, potatoes and of course, butter. 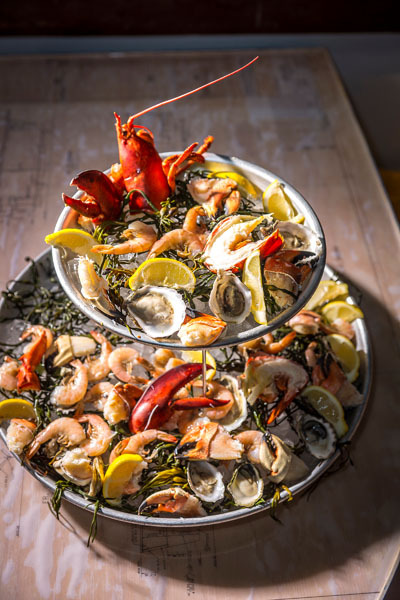 If you’re feeling even more adventurous try their raw bar complete with chilled lobster, shrimp, clams and oysters. If for some reason you aren’t salivating already just picture the perfectly cooked and seasoned truffle Parmesan fries alongside your savory lobster roll. To experience an even more carefree experience take advantage of the happy hour or the drink list at any time. Serving mason jar cocktails, such as the cleverly named Pop-Sea-Cle, which has brut prosecco, cordial and popsicle and the option of either elderflower, melon, or aperol. Besides a cocktail North River Lobster Co has beer buckets, sangria and a range of wine for any type of buzz. The elegant yet iconic restaurant, Aureole, is located at One Bryant Park that showcases Chef Charlie Palmer’s signature Progressive American cuisine that has been a game changer on the New York City power dining scene since its inception over 20 years ago. Palmer takes a twist on the classical French cuisine and uses unique and unexpected combinations of flavors within his meals. Offering both an elegant and casual environment, seen in The Liberty Room, Aureole can accommodate any foodie. 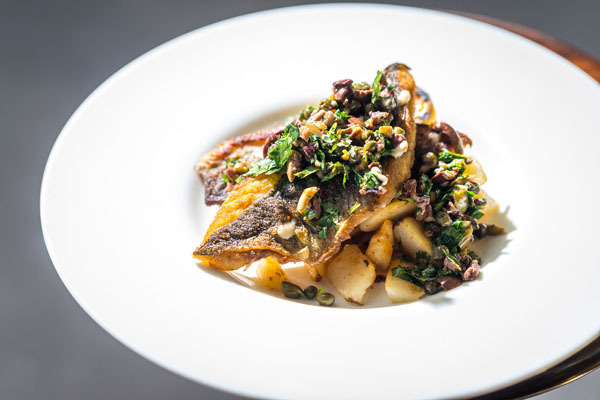 Prix Fixe is available for lunch which has a set price with either a two or three course meal with a variety of small plates, pasta and fish or meats to choose from. If you’re feeling a lighter meal try the popular Foie Gras Torchon complete with strawberry, champagne gelee and brioche toast. 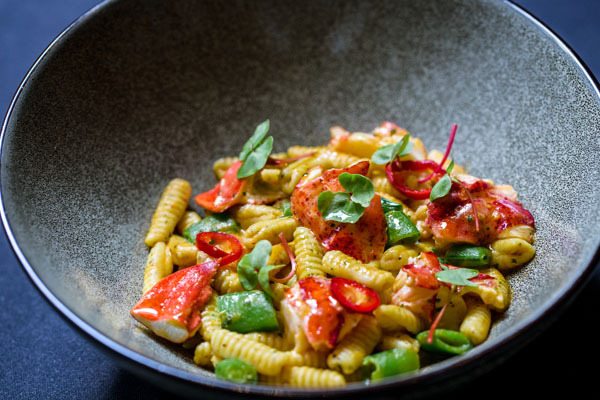 The hungrier guest can go for the Lobster Cavatelli prepared with truffled ricotta, sugar snaps and lobster sauce. Dinner on the other hand is served as either a three, five, or the decadent seven course meal that showcases the extraordinary culinary talents of the kitchen. With a newly lauched spring menu choose from mouthwatering appetizers such as Wagyu beef carpaccio with caramelized onion, or macerated strawberry with a foie gras torchon. New entrees to the menu also include a poached Maine Loster with lemongrass, Moulard duck magret with pickled muscat grapes, a seared Double R Ranch NY Strip steak with jalapeno demi glace, or a Nova Scotia halibut with minted peas, clams, shitake and a fumet broth. Be sure to save room for dessert with options so sweet you’re tastebuds will tingle just reading the menu. For instance the Chocolate Peanut Bar which is a four layer mousse cake, parfait and salted peanut ice cream. Whether you’re trying to watch the moonrise and party with friends or mingle with coworkers Lovage will put anyone in the best mood. 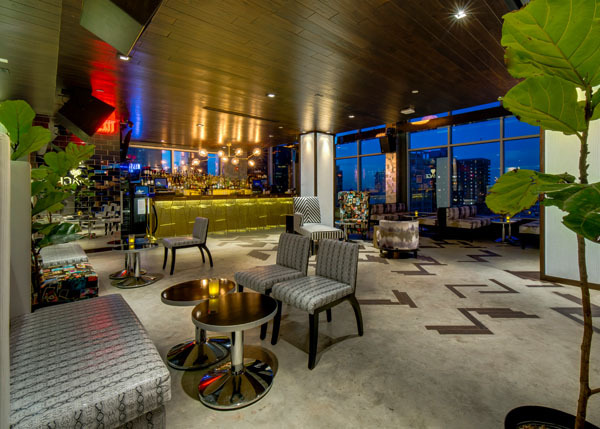 Lovage is 4,000 square feet rooftop lounge atop the Doubletree Hilton. With 17-foot floor-to-ceiling windows a glass roof, and an outdoor terrace this is the perfect spot to be mesmerized by the sunset or stars at night. This 360-degree view is the optimal vantage point to experience breathtaking views of New York City spanning from the Empire State Building and Times Square to the Freedom Tower and the Statue of Liberty down the Hudson River. The contemporary décor reflects the modern and understated chic environment Addison Hospitality is known for. Indulge in extravagant elixirs filled with cleverly named cocktails that can entice any guest. For instance, the one Tropical Storm you don’t have to worry about is Lovage’s which is complete with Mount Gay Black Barrel, fresh mint, fresh lime and topped with Ginger Beer. If you’re one to go for the tequila, also known as te-killa try the Cancun Swizzle. This cocktail combines Heradurra Silver Tequila, Disaronno Amaretto, Creme of coconut, pineapple, fresh lemon, 151 Don Q Rum Float and cinnamon. Any guest of Lovage will be giddy in no time with the marvelous atmosphere and scenic views.